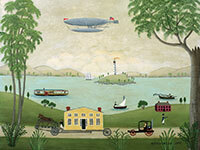 New England and Florida scenes in the folk art style. 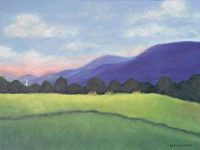 Most of my paintings are of real places; however, I also paint and teach painting in the Rufus Porter style. 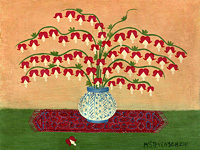 All of the images you will see on my website have been painted by me. 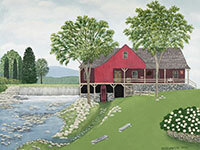 My work consists of original paintings, house portraits, limited and open edition prints, vinegar graining, and greeting cards. Thanks for visiting. I look forward to hearing from you. Martha. 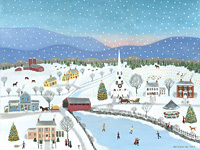 Discounts are offered for artwork purchased in person at Martha's Folk Art Gallery or at any of Martha's own art shows. For international orders, please contact me for shipping rates. Galleries interested in exhibiting my art, please contact me. 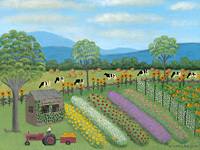 All other special orders and requests can be made by emailing me at martha@marthasfolkart.com.